FINALLY! 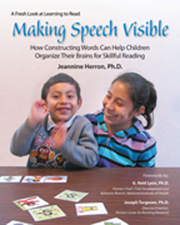 My book, Making Speech Visible, is done and published! It has been a major preoccupation for the last year. I have tried to synthesize my 35 years of reading research into a simple and readable book for parents and educators. I am 74 this year, and there comes a time when you want to put what you have learned into the hands of others. So, Making Speech Visible is also biographical. It includes short vignettes about how I got interested in reading research and what people said to me along the way to move me in one direction or another. I have pursued this one path most of my life—finding and communicating evidence that writing is the best path to reading. Recent brain studies are concluding that the automation of letter-speech sound processing takes many years to develop because it is not just the learning of an association, but a neurobiological integration process involving the linking of speech and reading networks. The young reader must combine a large number of paired-associate memories (26 letter shapes, 40 speech sounds –26 more if he learns both capital and lower case shapes) and organize them in his brain in such a way that they can be combined and recombined in immediate and instantaneous access to word pronunciations and word meanings. To achieve automatic visual word recognition, these networks must begin to accomplish with one stroke of attention what originally required dozens. The young brain must systematize the work to be done and must develop a system of automatic habits corresponding to the system of tasks, because reading (unlike speech) does not come pre-wired. As reading is first introduced, the brain organizes and stores the information wherever it is processed. If the instruction involves pronouncing and segmenting whole words, and linking letter shapes to those spoken sounds in a systematic way, these new networks, over time and with practice, will be linked efficiently to word pronunciations and meanings. Therefore it is important that early instruction in phoneme awareness and phonics encourages children to attend to their own physical production of phonemes as they segment words, and builds new reading skills on the neural foundation of existing speech networks. Technology Won’t Teach Without YOU! Pre-K Lessons Linked to TV Produce Gains in Literacy (but with a big caveat!) This summary is from an article Education Week, Oct 21, 2009. 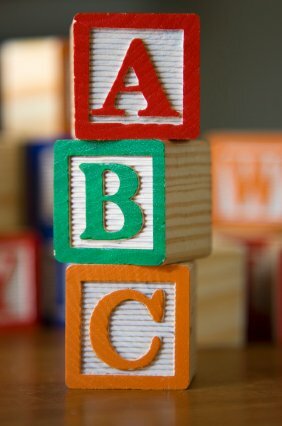 A new study has found that low-income pre-schoolers made significant gains in acquiring skills such as naming letters and knowing the sounds associated with these letters, and understanding concepts about stories and printed words. These gains were found after children participated in a technology-supported literacy curriculum that used videos from “Super Why”, “Sesame Street”, and “Between the Lions” (PBS) as part of the Education Department’s “Ready to Learn Initiative”. But the program used what they called ENGAGED VIEWING. 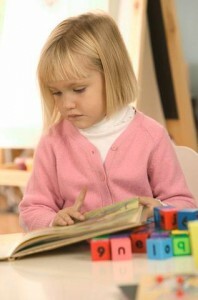 Is there really anything new to say on the subject of reading and reading difficulties? Indeed, there is! Recent advances in medical imaging technology have made it possible for the first time to look at the brains of both skilled and dysfunctional readers while they are engaged in the act of reading and chart the strikingly different ways in which their brains are working. The most dramatic new discovery is that if dyslexic readers are provided intensive special tutoring and improve their reading skills, one can literally see that the brain changes its pattern of activity to produce a more efficient way of reading. These new insights, based not on theories but on the actual brains of actual readers have led to new ways of thinking about how to introduce children to the alphabet and to reading, and how to prevent reading difficulties. Reading is a new human skill. Humans have been using some form of language in verbal communication for about two million years, but reading and writing have only been around for a few thousand. We don’t know what early language sounded like but whatever its form, it’s pretty clear that language, and the capacity of the human brain to organize and express it, changed and evolved over the eons to accommodate more and more complex conversations. Mothers found ways to tell their children how to keep out of trouble, and fathers found ways to brag about the hunt as the family gathered around the stew pot. I’m going to digress from the topic of reading for a moment. Have you been wondering why so many children seem to be affected by autism-spectrum difficulties? I have. Here’s some interesting news from the M.I.N.D. Institute at Davis, California. The M.I.N.D. Institute has been searching for clues to autism’s increase. Although the criteria for diagnosing autism have broadened and children are being diagnosed at an earlier age, these factors don’t explain even half of the huge increases in California cases. So what’s left? The environment! The Institute suggests that a careful look at environmental exposures is warranted, especially for their possible affect on genetically susceptible children. They are doing some fascinating studies that I will try to comment on in future blogs. At the SSSR meeting in Boston, I was fascinated to learn about a new study by Linnea Ehri and Nancy Boyer who taught pre-schoolers to look at themselves in a mirror while pronouncing a word, and then play with mouth pictures that represent the articulation of the same sounds. When children associated those mouth pictures with letters and manipulated the letters to represent the sounds in words, they performed better than children who just manipulated the letters without the articulatory component. So instruction that includes teaching children to become aware of how their mouths move to make the sounds of words would help children make the connections between speech and the alphabet code. Change is slow…unless we help! THE GOOD NEWS—Many Reading Problems Can Be Prevented! I’m getting on a plane tomorrow to fly from San Francisco to Boston for a week. I’m attending a conference where I’ll have a chance to talk to many friends and colleagues who have, like me, decided to spend their lives trying to understand why some children have difficulty learning to read and what we might be able to do about it. It’s the annual meeting of the Society for the Scientific Study of Reading, a gathering of over 300 researchers from around the world who study everything about reading — brain structure and function, related cognitive and behavioral issues, and instruction and intervention techniques. You can find abstracts of the talks on the SSSR web site. I look forward to learning new things to add to the knowledge I have accumulated from my own research over the last 37 years.